Every once in a while a project seems to take a whole lot longer than it should. When we moved onto our small acreage fifteen years ago one of the first things I started was a 'building' for the large commercial trash container. True to our style it wasn't to be ordinary. The 'building' would be a hollowed out mountain with giant metal doors on the front. But before I could finish Trash Mountain things got busy and the project was put on hold temporarily. By the time work commenced once more the following year the location had moved temporarily. Trash Mountain would move two more times through the years as we rerouted the driveway and then built the new house. The tree was finished and set on top. Four years ago the concrete pad was poured and the structural frame was bolted down permanently at last. Through the last two summers we've finished welding the framework and applied the metal lath. This year we are determined to finish the structure at long last. 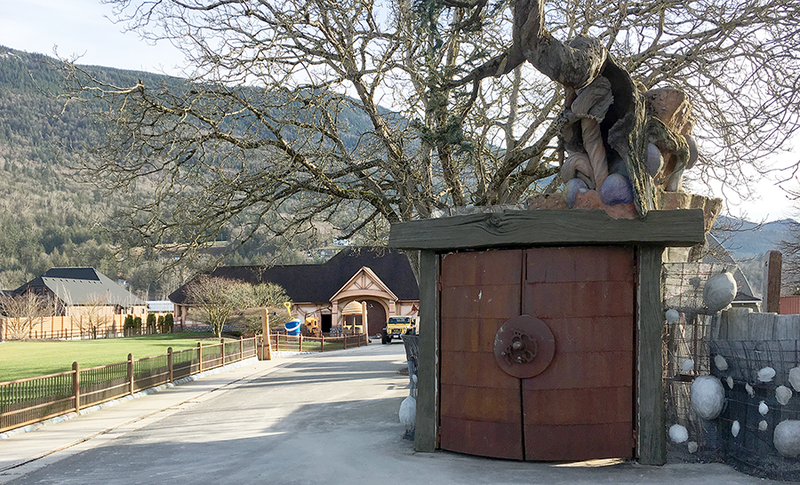 With the onset of the first warm spring days the crew sculpted the giant timbers around the door today and they look fabulous!